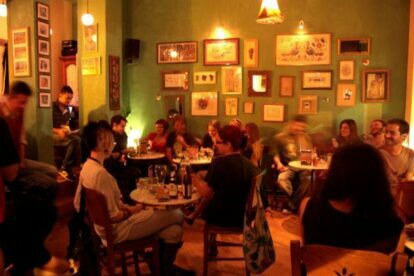 Varnava café, or most known by the locals as “Themis”, is one of my favorite spots in Athens. It is one of those places that I am emotionally attached to, as I have been going there all my life. I remember playing on Varnava square as a kid and my mother would sit on this café. Then I remember going there for coffee with my friends after school or even when I should be at school (sssh! don’t tell my mum) and Themis, the former owner, would tease us and call all girls “models”. Now I still go there for two reasons. First, Varnava cafe is the place where I gather with my childhood friends. Second, the drinks are very good and in very affordable prices. It is the ideal spot to enjoy the recently renovated Varnava square and to spent a night like a true local resident of the area (Pangrati! ).